I need to make a few adjustments to the Illowy post below, reflecting some new information and also reflecting personal reflections. However, I do not have time to do it now, but going into shabbos, I don't want the post as it is to be assumed to reflect everything I have to say about it. Please read the update at the bottom of that post. The thrilling adventures of . . . the Aleppo Codex? Crown of Aleppo: The Mystery of the Oldest Hebrew Bible Codex by Hayim Tawil and Bernard Schneider. One thing seems certain; given Tawil's involvement, even if it is Da Vinci Code-sque with a silly plot and contrived contrivances, at least the facts will likely be facts. Plot prediction: a secret cabal of Syrians with a lair on King's Highway will be hoarding missing leaves. Tawil is about to publish a new lexicon of Akkadian (link). See this Yeshiva University press release (via Hirhurim). Vandalism? Please leave Rabbi Illowy's grave alone, thank you. A friend of mine is researching R. Bernard Illowy (נ"א Bernhard Illoway), so I was poking around for some info about him, and came across this. Wow, I have been looking for his kever for many years. It's a shame that its fading away. Do you know what it would cost to replace? A little steep, I'll see what can be done. I don't know the precise circumstances surrounding the disclaimer, but evidently there were those who accused Rabbi Illowy of using his rabbinic position to enrich himself. Now, I have no idea if he was even wealthy, but of course that wouldn't stop tongues wagging anyway, as they do. I do know that in Harold Scharfman's book about R. Abraham Rice, "The First Rabbi" he reports that in 1861 Illowy's salary at his Baltimore Hebrew Congregation reduced his salary from $1500 to $600; his friends took up a collection and raised an additional $400. It seems that the New Orleans congregation Shanarai-Chasset , pleased with his -- how shall I put this, not anti-slavery position -- offered him the vacant pulpit for $2000, but he declined. But I also never lived in Baltimore in 1860. Finally, an expert explains why tombstones are important: Dr.Leiman's post here. Note: we seem to be in minor disagreement, as he seems unconcerned about the stones per se, as he is about the content. I would preserve both. In any case, I look forward to the fruits of my friend's research. As I mentioned on Friday, this post needs some updating and clarification. I received an email from Baruch Amsel, the webmaster of Kevarim.com who explained to me that in previous cases when headstones were replaced due to the shabby condition they're in, the old ones were actually lain as footstones rather than discarded or, you know, stolen. An example of such spruced up graves include those of Rabbi Rice of Baltimore. Thus, the commenter was not looking to uproot history but rather to preserve it. I guess I owe an apology for assuming that I was had come across good, but boorish, intentions. Furthermore, the photo is new and the stone really is in bad shape (at least in the judgment of those who've seen it). Secondly, I have been thinking about whether or not it is fair to have even used the word "evil" in describing the non-abolitionist position of a Baltimore spiritual leader in 1860. While it is true that I noted that I could not place myself in his shoes and guarantee that I'd have taken what I believe was the correct moral choice even then, perhaps I should not have even suggested that the reader should decide if his view was "evil." Okay, this isn't really a sukkah decoration. But it sure would make a great one. R. Jonathan Eybeschutz holding his infamous amulet. About R. Elazar Fleckeles and R. Bezalel Ranschburg's friendship with Prague's censor, Karl Fischer. Now, every book published in Prague in those days had to be approved by the state's censor (and everywhere else too, I imagine, except the United States). Naturally being the censor for Hebrew books required specialized knowledge, and that's why the role was often filled by a Jew (who either had or had not converted to Christianity, as the case may be). However, there were some very Hebraically knowledgeable Christian censors, one of whom was Karl Fischer (1757-1844), the censor in Hebraicis in Prague. --means much more. Fischer was approving a biography of his friend. As it happens, there is a highly interestingly biography of Karl Fischer by Iveta Cermanova, two articles in Judaica Bohemiae XLII and III totaling 112 pages, called Karl Fischer (1757-1844). The Work of a Hebrew Censor. (based on an earlier paper by her). Among many other things, this article examines Karl Fischer's relationship with R. Elazar Fleckeles. "I am beset with pain and overcome with grief for Mr. Ungar, the Imperial-Royal Councillor and Chief Librarian, departed from this life in the night of 8 Tammuz. . . . Apparently they knew each other as early as 1788 (given that in one 1806 letter Fischer reminisces that their friendship goes back 18 years). Their formal correspondence was in German, with their informal and personal matters conducted in Hebrew. Below are some Hebrew letters reproduced by Cermanova. While it is true that it was in the best interests of the Chief Rabbi (or any rabbi or would-be Hebrew author) to be on cordial terms with the censor, in fact this seems to have been a real friendship. They apparently met each others family. In one of the letters R. Fleckeles sent his own wife's greetings to Fischer's wife Anna. In another R. Fleckeles "pays his compliments" to her, whatever that means. In another Fischer sends regards to the rabbi's son Meir, and so forth. Interestingly, they also exchanged holiday greetings, and that included Christmas. Their exchanges covered diverse topics, with R. Fleckeles often answering Fischer's queries on Jewish issues, such as Jewish honorifics and the meaning of certain Hebrew words. However, their friendship also extended to loaning books to one another and playing host, including one Purim where Fischer was Fleckeles's guest. Fischer also got along well with his sons-in-laws, including R. Yitzchak Spitz (Yom Tov's father), exchanging friendly letters with them as well. Apparently he was also quite friendly with R. Fleckele's close friend R. Betzalel Ranschburg (1762-1820). In fact, among Fischer's papers are 60 letters from R. Ranschburg. According to Cemanova who had the pleasure of reviewing them, although most of them are about official business, they too are friendly, full of holiday greetings, apologies for not being able to visit, and so on. Dashing the historical perception of people everywhere, R. Ranschburg was wont to send Fischer gifts, including an esrog one Succos, and mishloach manos (ish le-re'ehu) on Purim. The Rosh Hashanah greeting by R. Ranschburg below is dated December 19, so it is obvious which Rosh Hashanah it is from. Fischer in turn treated and viewed these rabbis and their friends as his own friends, doing them all sorts of favors, one of which turned out to be a big favor indeed -- to Jews everywhere. Let me preface this by pointing out that he was not some sort of dupe. He was the censor for an absolutist and intolerant regime which granted no right of free speech for 50 years. He did not receive or maintain this job because he did not really read and he did not really censor works submitted to him. He did his job, of course. On one occasion Fischer wrote: "I do not . . . provide a general apologia for the Talmud without any exceptions; no, that is not the case, for if local Jews wanted to have it republished today or tomorrow, then many passages would have to be removed from the Gemarah." In addition, in some of his later writings he refers numerous times to Eisenmenger (post on him forthcoming) although he seemed to have pointedly refused to use him as a source earlier. Although his friendship with the most traditional Bohemian rabbis are described above, he personally was a supporter of Enlightenment-motivated reforms by the government meant to modernize Jews. However, it should be clear that he was no antisemite, had a great deal of interest, knowledge and admiration for things Jewish. He maintained notes on the Talmud, which he accumulated in a monograph which was completed already by 1802 (or more likely, 1792), but remained unpublished until almost 40 years after his death, the Gutmeinung über den Talmud der Hebräer / Testimonial on the Talmud of the Hebrews. This was published by Jews, from manuscript, in 1883 due to the great rise in antisemitism in the last quarter of the 19th century. “The first [Dayyan], Rabbi Eleazar Fleckeles, is a widely respected scholar, a prudent and renowned man and, moreover, a skillful preacher. 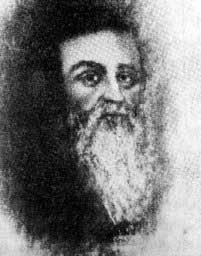 His colleague, the second Chief-Jurist, Samuel Landau [the Noda Be-yehuda's son], is his adversary and opponent in everything; he has the rabble on his side, while the other is backed by scholars and notables; fire and water or wind and earth are more likely to be in harmony together than these two. Nothing is known about the third Chief-Jurist except that he is an ignoramus and is about as useful as the fifth wheel of a coach. How is it possible in such circumstances, then, to expect a more fruitful Enlightenment? 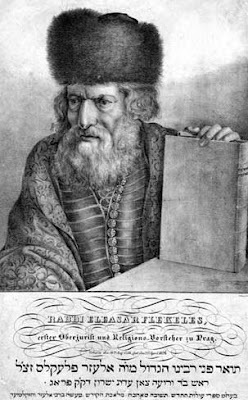 ... but were the first Chief-Jurist Fleckeles also to be the Chief Rabbi of the country, as there is one [rabbi] appointed for Moravia, and were he to have good men as his colleagues, like Rabbi Daniel Joel Rosenbaum, Salomon Kauder and such like; if there were more enlightened and upstanding rabbis in rural areas, such as the regional rabbi Isaac Spitz (to which the undersigned also adds the regional rabbi David Levit and the rabbi of Jeníkov Samuel Brod), then everything would certainly work much better. Interesting that according to this testimony he was said to have slept half the amount that was said of the Vilna Gaon; one hour in 24, instead of two in 24. Herz Homberg in a classic commentary to Targum Onkelos, but not in Nehama Liebowitz's bibliography. An interesting category of works are ones which are themselves totally acceptable to cite by anyone, but which contain citations that are totally unacceptable to cite by many people with such hang ups. What was so bad about Homberg per se? The image of the educator and maskil Naftali Herz Homberg (1749-1841) is almost universally negative in Jewish historiography. He is generally described as a radical enlightener at best and as a corrupt opportunist at worst. In the words of one historian, "he hated Judaism with the utmost hatred." This negative depiction is primarily the result of his activities in Galicia as the supervisor for the German-Jewish schools on behalf of the Austrian government The present article demonstrates that this negative image was first created in the 1860s with the partial publication of archival documents by the Viennese historian, Gershon Wolf. These documents, as interpreted by Wolf, are practically the only source for Homberg's sullied reputation. The view of Homberg that is offered here differs sharply from the way he is usually portrayed in Jewish historiography. This is achieved through a brief examination of several of Homberg's works, a description of the Austrian historical context, both Jewish and non-Jewish, a critical look at Wolf's publications, and the presentation of newly-discovered archival material. Homberg was, in fact, an enlightener in the mould of the Josephinian enlightenment. This enlightenment was fundamentally religious, yet believed in the supremacy of the state over the church in non-ritual matters, and in state-sponsored education that emphasized the formation of a religion-based moral character. Homberg, who saw himself as a student of Mendelssohn, was never alienated from Judaism, nor did he ever call for the abolition or weakening of the ceremonial law. There is no evidence that he himself did not observe the commandments. He did, however, support the full integration of the Jews in the Austrian state, and the consequences of this integration. Despite the contention of the article that Homberg's ill reputation is derived from a historian's interpretation beginning in 1860 (and is really undeserved), the fact remains that he was quite despised by traditional Galician Jewry, and his reputation as one who "hate[s] Judaism with the utmost hatred" preceded 1860 and derived from the man and his life. 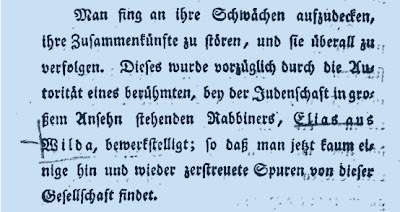 As an example, it was decreed in 1812 that any Jew in Galicia who wished to be married had to be quizzed in German on Herz Homberg's Bene Zion, which I assume probably helped the book's sales; don't think this went totally unenforced either. Just try to imagine all those young, early 19th century Galicianer couples trying to make heads or tails out of the book below. Furthermore, R. Adler was not "soft" on Reform, and was living on the Continent, and not England, during Homberg's heydey. He knew exactly who he was. However, one supposes that R. Adler did not have hang ups about citing questionable characters. But certainly many an admirer of the Nesinah Le-ger commentary would not wish to follow his advice and see what Herz Homberg had to say on the subject or would not wish others to do so! As you can see, somehow only four of the five Biur commentators are mentioned. The fifth, Herz Homberg, is not mentioned at all. In point of fact, Aaron Jaroslav, who commented on Numbers in the Biur, is an almost totally obscure figure. Most people aren't even aware that he was a part of it, and very little is known about the man. The same cannot be said for the other four, Homberg included, all of whom were famous or infamous in their own way. Thus, it seems strange that Herz Homberg was left out as an oversight, but it is still possible. An unfortunate typo, but Elias aus Wilda is the Ga'on of Vilna. This of course raises the question of what the Gaon looked like. The article to read is Zusia Efron's Portrait of the Gaon of Vilna, Two centuries of Imagination. In it he maintains that there is only one portrait which was painted in the Gaon's lifetime. It is the one below, and it is from circa 1750-55. This is the only "authentic" portrait. All others are later and copied each other after a fashion. The later ones seem to become increasingly more elaborate. First they begin to show him in fancy rabbinic garb, and finally tefillin lies on his head, which apparently didn't begin to make it's debut until the 1880s. According to Efron, a similar portrait (i.e., based on this one) was the one which hung in many misnagedic homes. It came from a frontspiece to some sefer or another. Unfortunately I only have a tiny image of it, not really worth posting. However, it is perhaps notable that the image shows him looking quite severe. "The only original copy of the Great Genius, Rabbi ELIOHU, known as the "WILNER GOEN"
It seems that the Gaon not only had tefillin and a yarmulke plopped on his head (where is the strap?) but even his garb was changed, perhaps because what was good rabbinic garb in the 1820s had changed and seemed too . . . fancy? What did Torah reading sound like 500 years ago?